When Apple makes a product or service release, it is one of the biggest news in the tech world. So when last month the most-valuable-brand came out with its iOS 8.3 update, this news became the new buzz on the web. Techs, users and fans all start started scouring the web for all the information about what was new, the bug fixes over iOS 8 and when and how they can update their iPhones or iPads. So this post will also become part of that buzz that’s doing the round over the Internet and bring you 3 most noticeable developments in the new iOS update. Yes, it’s possible now to download free apps from the App Store without entering the password. However, this will require that you make some changes in the settings. It will certainly make things much easier especially considering that you are downloading free apps. There isn’t much new in the Siri “department” except for a few tweaks here and there (including support for new languages). But the speakerphone call option is quite impressive. Calls could be made through voice command in iOS 8. But Apple has added a new feature. Now you can ask Siri to make a call “using speakerphone.” So, you can make calls even when you are driving. The “Hello Siri” command will wake up Siri and you can then use the speakerphone command to make phone calls hands-free. This may be the “biggest” feature in the new iOS for many iPhone fans (especially for the ones who like to spend a lot of time texting). Apple hasn’t just added a few dozen emojis to its new mobile OS. It has added more than 300 new emojis! 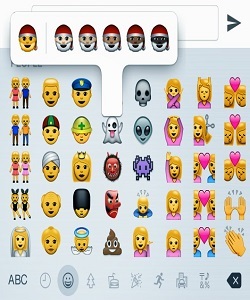 Besides, users can customize several of these emojis, especially with regard to changing colors. Tap and hold onto an emoji and you will get several customization options. The Cupertino-based company has released several other new changes to its mobile OS. Some of the other notable ones include better management of messages in iMessage and fixing dozens of bugs from the previous operating system. The iOS 8 has often been touted as the most-bug-ridden iOS. But the company has fixed most of them. There are rumors that the company may also unveil the iPhone 6S or iPhone 7 this summer (or at least before the holiday season). So this summer is going to be a big time for all the iOS users.